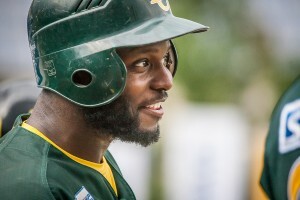 Ahead of the first game day in the German Baseball-Bundesliga Mister-Baseball.com did get a chance to speak to BJ Roper-Hubbert. The player manager of the Bonn Capitals answered a couple of questions previewing the new season. Mister-Baseball.com: The German Baseball-Bundesliga is starting this weekend. What are your expectations in general and individual? BJ Roper-Hubbert: I expect this season to be very competitive. A few teams have really went out and recruited new players expecting them to make their teams more competitive. My hope is that the league will be stronger because of it. As for the Caps I’m extremely excited about seeing the results of the hard and focused work we put in this winter. And I expect us to be very focused this season which I think will mean a lot of success. Mister-Baseball.com: Which new import players will make an impact in the league? BJ Roper-Hubbert: I don’t really know who will make an impact for the other teams. Haven’t paid enough attention to who’s coming in. I know that Daniel Lamb-Hunt had swung the bat exceptionally well this preseason. And I think Wilson will build upon the success he had last season. Mister-Baseball.com: Which young players could celebrate a breakout year in Germany this summer? BJ Roper-Hubbert: If there will be breakout players I assume those players could come from Paderborn/ Regensburg being that they have the internat there to draw from. Mister-Baseball.com: Which teams are favored and will reach the playoffs in the German Baseball-Bundesliga? BJ Roper-Hubbert: The usual suspects are probably going to be favored. Regensburg, Heidenheim, Solingen, and Mainz are going to be strong as always. But like I said many teams went out to get new players. I think a few surprises would be nice to shake things up. Mister-Baseball.com: What team is going to win the championship? BJ Roper-Hubbert: Beginning of the new season, it’s too early to say. Of course I like our chances with the squad that we have even without getting any fresh players. New players from the other clubs will hopefully continue to raise the level of play. Not going to speak too soon, when I can just wait and we’ll see at the end of the season.